The proposed West Carleton Environmental Centre builds on our long standing commitment to being a responsible and engaged corporate citizen and represents the opportunity to create significant economic and community benefits. The West Carleton Environmental Centre will create up to 75 green jobs in waste diversion, disposal and green energy facilities. Economic benefits will also extend to the larger community through community host agreements, as well as a revised Community Trust Fund to support local projects. In addition, revenue opportunities will be created from waste diversion activities for local processors and downstream activities related to recycling and re-use. During the construction of the new operation, local suppliers and contractors will also benefit. There will be millions of dollars invested in the construction phase and our preference is to use local suppliers and contractors wherever possible. Waste Management’s current site has extensive non-operational lands. Some space will be required to support the facility’s operation, but other lands will be dedicated for community uses that could include sports fields, biking and hiking trails and a leash-free dog park. Community input will be an important part of determining the ultimate use of these areas. Residents and community leaders have told us that they value increasing the amount of available recreational and community lands, and we are responding by setting aside space surrounding our operations for dedicated community use. An on-site wildlife habitat centre will be opened to the public and will serve as an education centre for the community. Waste Management will also expand existing wildlife habitat projects through collaborations with the Mississippi Valley Conservation Authority, Ducks Unlimited Canada and Rideau Valley Conservation Authority. 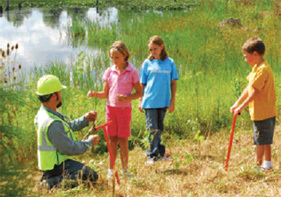 Waste Management also plans to expand its outdoor educational programs with local schools and service organizations. The West Carleton Environmental Centre has received international recognition for its contribution to wildlife habitat conservation in the form of a Wildlife Habitat Council (WHC) certification in 2015. Waste Management is the only waste management company in Canada to receive WHC certification.